With lots of pizza places in and around Portland, it’s difficult for a young pizza purveyor to stand out. There are a few go-to locations that I use on a regular basis if I’m ordering takeout. However, sitting down at an actual pizzeria tends to make me think a little harder about where I want to go. Enter Lazzari on Congress St. earlier this year. I headed back there for a repeat visit this week to see what the eatery had in store, knowing that parts of the menu had been updated for the season and that I would get a look at some different items than when I was last there. We took a couple seats at the bar and I was struck – again – by how large the place was. We started to look over the menus. The drink list appeared quite familiar and I remembered many of the cocktails. My wife quickly decided on the Triple Berry Lemonade – Triple Berry Anaheim pepper vodka, blueberry puree, lemon juice. That was what I had ordered on my previous visit, so I knew it was a strong choice. 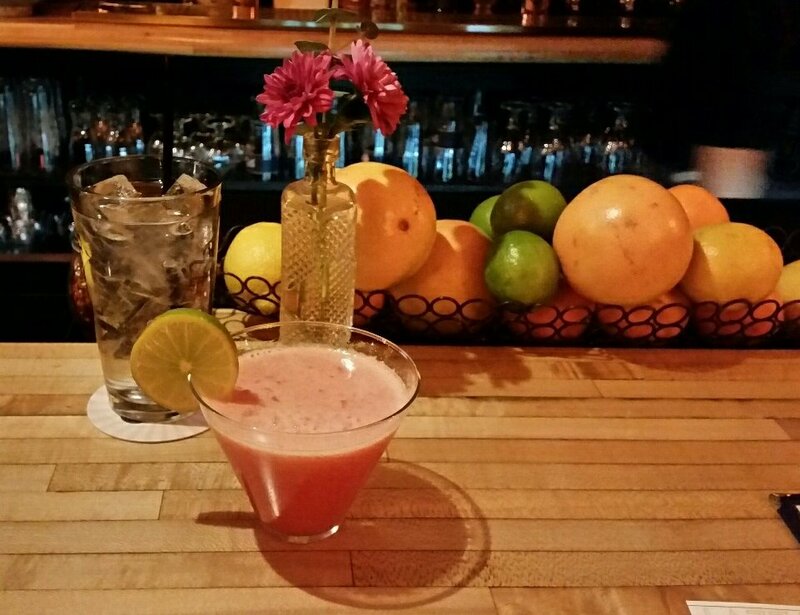 This time, I wanted the Strawberry Basil Marguarita – strawberry basil tequila, Combier Original, lime juice, strawberry puree, salt rim, served up. I ordered without the salt. Our drinks came out looking gorgeous and I enjoyed mine immediately. It had lots of berry, enough basil, and the right amount of citrus. The fresh, mildly sweet and tart flavors were like a great dessert, and once again, I had a drink I wanted to consume in seconds. Instead, I focused on discovering the right items to feed my internal emptiness while saving my libation to drink over time. 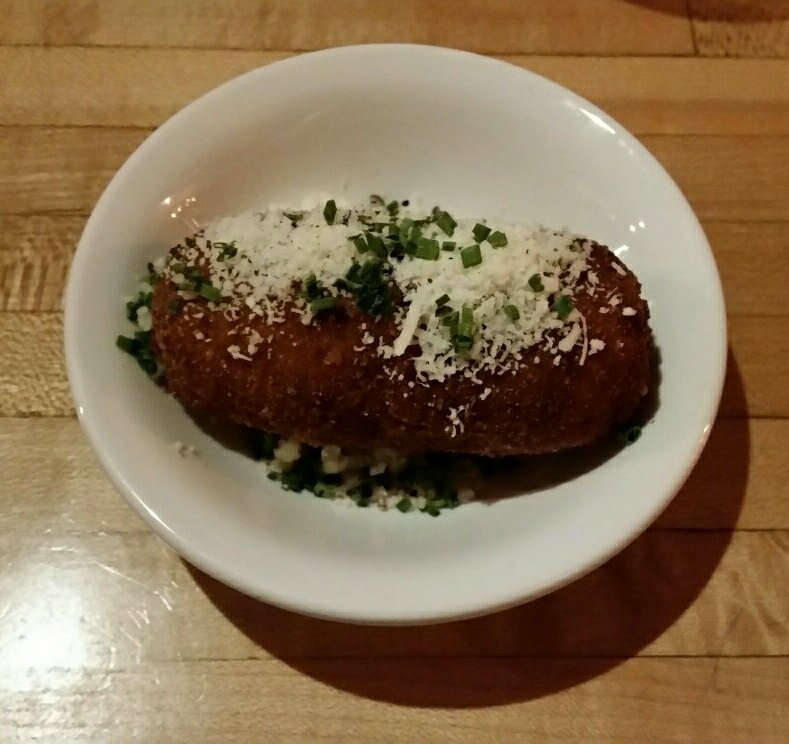 In my search for an appetizer, I happened upon the specials menu and saw the Suppli – fried tomato and mozzarella rice croquettes – generally considered to be Italian street food. I ordered that and also put in a request for the Sausage and Onion Pizza – sausage, grilled onions, mozzarella, tomato, ricotta, and rosemary. 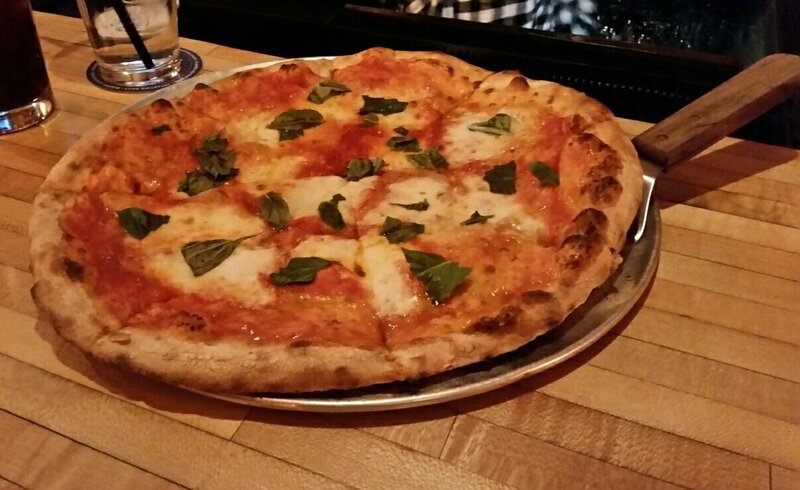 Mrs. Portlandeater went with her usual Margherita – tomato, mozzarella, and basil. As we consumed our wonderful drinks, the elves in the kitchen worked to create the food, delivering the croquette within a few minutes. The bullet-shaped rice and cheese suitcase came out in a bowl on top of a pool of grated cheese. I cut into it right away and forked it toward my mouth, noticing some cheese strings running from the bite I cut to the remaining larger piece like a tin can telephone line. My suppli was awesome. The hard, crunchy outer shell was perfect and the flavors were tight. If I had one criticism, it would have been that it could have used just a little more cheese. I’m reaching a bit though, because it was brilliant overall. My wife and I enjoyed it greatly and took our time savoring it while we waited for the pizzas. When the pies came, we procured slices without delay. I was pleased with the amount of toppings. I enjoyed the primary items, but I also liked how the drops of ricotta enhanced the pie. It added something a little more and felt like extra cheese in addition to the mozzarella, I suppose because it was. The crust, as always, was thin and left room to taste every part of the saucy saucer. Thick crust has its place for sure, but it’s not here. I’d had the Margherita before, but the beauty of it was the simplicity. Simple flavors made from high quality ingredients, the marguarita isn’t so much my style in that it is relatively boring as pizza goes. Still, I was happy to try it and found it a fine example of the old classic. If you like tomato, basil, and mozz like my wife does, this one was a winner – no nonsense and all the key flavors were present in ample portions. After a few slices each, we decided to take our remaining pie home. The bill came to $67 including tip and we had a fair amount to eat the next day. Lazzari is doing a lot right, and I have yet to find any fault with them. Their pizza – and other food – is all excellent. The service and staff are friendly. And here’s something…I think they might have some of the best drinks in town. I’ve had three and all were some of the most memorable I’ve had this year. 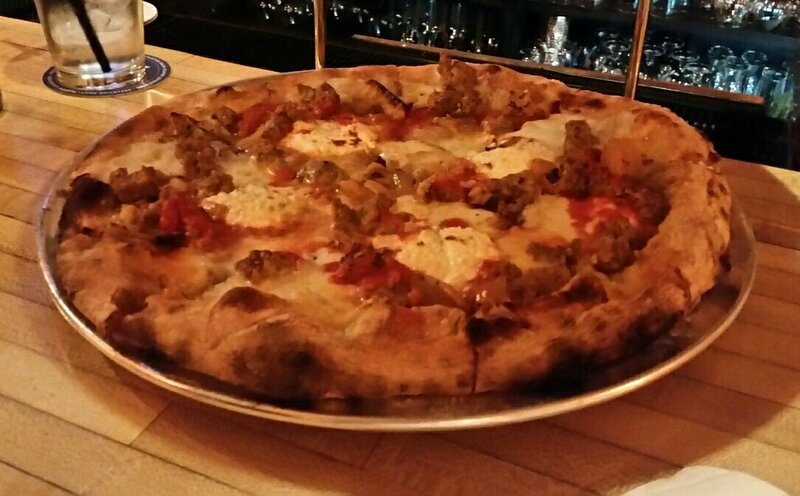 Lazarri isn’t redefining pizza, it’s just taking it and making it to exacting standards. They’re also making sure that all the side notes – non-pizza food, drinks, and staff – are killing it too. Whether you’re starting your night there, ending it, or it’s your entire evening, there’s no doubt a visit to Lazzari will make you happy. It seems to be what they do. And they’re doing it well. Feel free to email me at peterpeterportlandeater@yahoo.com with any thoughts, suggestions, criticisms, or otherwise helpful info or post your thoughts below. Also, like the Peterpeterportlandeater page on Facebook and follow @portlandeater on Twitter. You can also find over 50 articles archived at pppe.bangordailynews.com. This entry was posted in Portland, ME food and tagged blog, food, peterpeterportlandeater, pppe on December 23, 2017 by peterpeterportlandeater.